Cycle Orkney are main dealers for the Giant, Orbea, Raleigh and Claud Butler brands. We have also started to produce a small number of bespoke bikes. We can supply anything from a first bike right up to a full carbon spec road bike. We have a well equipped workshop and can carry out all manner of repairs and servicing, as well as a wide range of clothing including our own Orkney Cycling strip and accessories for sale. 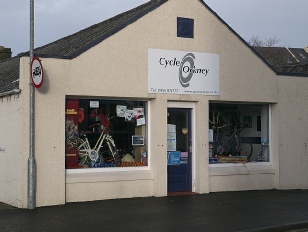 Cycle Orkney has been trading in Kirkwall for over 10 years, but a bike shop has been on the site for as long as most people can remember. It's a family business. Cycle Orkney’s aim is to provide a friendly service and honest prices, simple as that. The shop is located in Tankerness Lane, right in Kirkwall town centre and only a few minutes from the Cathedral, the building was for a number of years a stable, kennels and store. We have a range of bicycles for hire at attractive rates. Adults bikes are £20 per day, children's bikes are £10 per day, we offer discount rates for hires of 3 days or more, all prices include helmets, locks etc, although we do encourage you to bring your own helmet if possible. All adults bikes have mudguards and racks, we have a small supply of panniers but again we do encourage you to bring your own if possible. Finally, we are always happy to offer impartial advice for you your cycling needs. If you are planning doing some cycling in Orkney and just want some ideas for pleasant routes, just give us a shout or come in and see us.